Anguilla art galleries are as astonishing, unique and beautiful as the island itself. And Cheddie's Carving Studio certainly is one-of-a-kind. After a visit to Cheddie's, I guarantee that you will never look at a piece of driftwood in quite the same way. 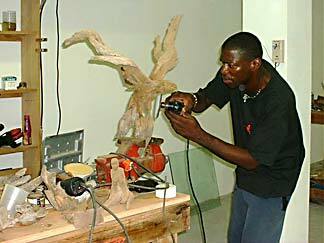 He turns regular driftwood into astonishing Anguilla art. Through these doors, you'll find some of the most creatively unique and sensitive sculptures. They grace and reflect a wide variety of Anguilla's natural world. 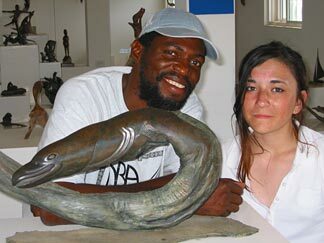 We discovered Cheddie's Anguilla art gallery on our initial trip to the island in March, 2002. His gallery is located in the West end of Anguilla, on the main road, near the Sol station and opposite Devonish Art Gallery (another interesting visit, but that's another story). We were staying nearby at that time, as well as on some other visits. We passed it frequently, always curious. Not knowing what treasures lay inside, we'd not break pace. We kept passing by that inviting store... always headed "somewhere else." "STOP!," I yelled at my Dad. Of course, I did not mean for him to stop right there on the road (which is what he did, thinking perhaps that he had not seen an animal on the road!). Our eyes wandered throughout the store, mesmerized by these pieces of art, hardly knowing what to admire first. 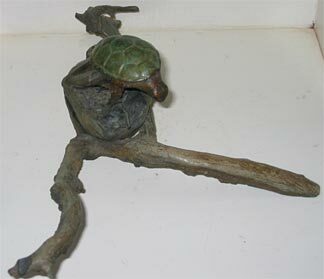 It's hard to believe what driftwood can turn into, in the hands of a master. Unfortunately, like I said, this "first visit" to Cheddie's was actually our "first visit" to Anguilla. We did not even realize that an Anguilla art community thrives on the island. And, at that time I did not have this Web site (nor had I yet dreamed of creating it). 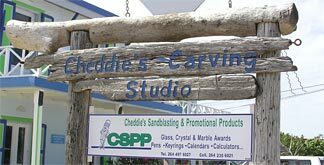 However, two years later, we made a special trip out to visit Cheddie's studio again (this time, we were staying on the East End, at Shoal Bay East). We got to meet Cheddie Richardson and chatted with him for a little while. Cheddie started "creating" in 1978. As a boy of only nine years old, he crafted boats out of matchsticks! His childhood passion led into a career. Art connoisseurs and the international press have recognized Cheddie's natural talents (he has no formal art training!). 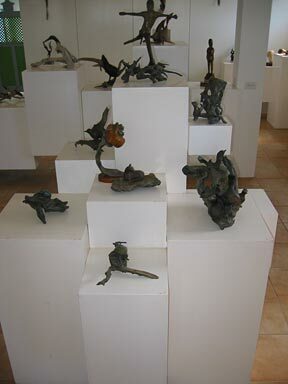 He has done many solo and group exhibitions in the Caribbean, been featured in several magazines, even mentioned on CNN. And in 1996, one of his astonishing art pieces was presented to Queen Elizabeth II during her trip to Anguilla -- it remains in the Royal art Collection of England. My dad took so many photos -- (he now has a second digital camera, the Olympus C750 -- he's gone digital camera-crazy!). I think he could have filled a single 256 MB card! Every piece is sensational and begs to be photographed! 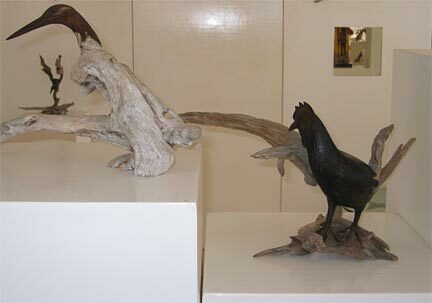 The sculptures themselves are exquisitely detailed and just seem to "emerge" from the piece of driftwood. It's incredible to believe that, what are now sensitive and moving sculptures, were once mere driftwood... washed up on the shores of Anguilla. I asked Cheddie what goes through his mind when he finds a nice piece of driftwood. 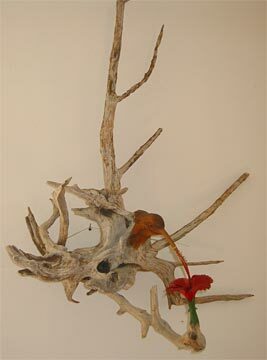 "Do you see the finished sculpture of Anguilla flora or fauna right away?" "No, sometimes I work with it for quite a while before the final form comes to me." There are few "true originals" in this world, my Dad says. But Cheddie's Anguilla art is the real thing. Mr. Courtney Devonish Originally from Barbados, Mr. Courtney Devonish and his wife, Carrolle have been calling Anguilla's shores home for decades. 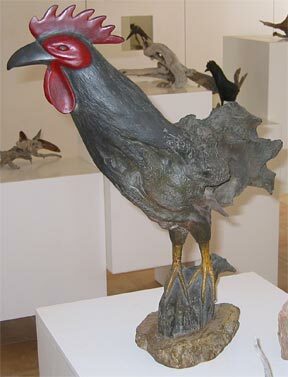 World-known for his mahogany carvings and ceramic pottery, Mr. Devonish's inspirational works can be viewed at his gallery, which is also home to a variety of carefully curated Caribbean and Anguillian artwork. This Anguilla gallery is a true celebration of Caribbean art. More on Devonish Art Gallery. Lynne Bernbaum: Her prints and art are astonishingly "Anguillian"... she captures the soul of the island and its people. We have several of her prints, very reasonably priced. Click here for our favorite art gallery on Anguilla. Henri: He grew up in Guadalupe, but found it too "fast-paced" so decided to "slow-down" in Anguilla. To him, "Anguilla is the best Caribbean island!" Click here for an Anguilla artist who captures the funky, feel of the island. 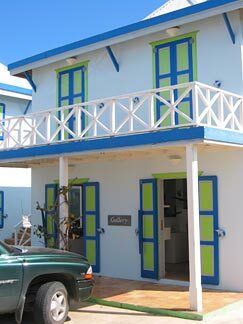 Pineapple Gallery: Owned by Parisian native, Philippe Manasse, Pineapple Gallery is Anguilla's first art gallery. It opened in 1983. This gallery specializes in Haitian art. With many different types of pieces, spanning from different decades, there is something here for everyone! More on Pineapple Gallery. Tanya Clark: A Canadian native, Tanya Clark's brightly colored "Phoenix Gallery," is truly one of a kind. Inside, her gallery is filled with her original whimsical paintings and even Japanese woodblock prints! She also offers quality framing services. More on Phoenix Gallery. Do you have a favorite, fantastic Anguilla art gallery or artisan? Please tell me about it.